No I didn't fall off of the face of the earth...although there were days, many of them, this past summer that sounded nice. A while back, my husband took a new job in Sandpoint, ID and our home has been on the market during arguably one of the worst housing markets in years. Not.fun.at.all. Between losing skin on my hands from so many Clorox wipes, constantly nagging at my kids to clean up their toys, picking up in the wake of destructo-child (my one-year-old), and having "surprise" house showings where realtors and their clients are suddenly in the entryway of your house...right after getting out of the shower. Yes, a transposed phone number entered into the MLS listing is never good. Somebody was getting messages about my house being shown, just not me... But the bright side is we finally sold the house, completed the home inspection, and finally expect to be settled in Sandpoint sometime in October. Thank goodness my poor husband doesn't have to keep driving the 3 hours a day for much longer. The icing on the cake is that a family with THREE girls, just like us, will be moving into the house just like I had secretly wished. And I'd almost opened up that can of beige paint, closed my eyes, and did away with the girly bedrooms...Sabrina Soto from "Get It Sold" was getting to me. Even with our house on the market, I was trying to squeeze as much junkin' and painting in as possible. I know one couple that came to see our house in July got to see my furniture projects in action. Half way through painting the top of a dining table...phone rings...realtors says "we'll be right over"...husband and I madly pile furniture into the corner of our backyard. And I'll never forget the couple that came during one of the "surprise" showings that peeked into the garage and saw the naked vintage mannequin that I'd just picked up laying right in front of the door. I hadn't had a chance to take it to storage yet. Needless to say, the shut that door quickly and left! Doesn't everyone have one of those laying around? I couldn't quite give up the junkin' habit, I just had to squirrel it away elsewhere (No, I'm not a hoarder). To get to Funky Junk: Wait until Labor Day Weekend, then go through Sandpoint on Hwy. 95; be in the right lane at the junction & continue on Hwy. 200; about 7 miles NE of downtown, take the Sunnyside Rd. exit and you're there! 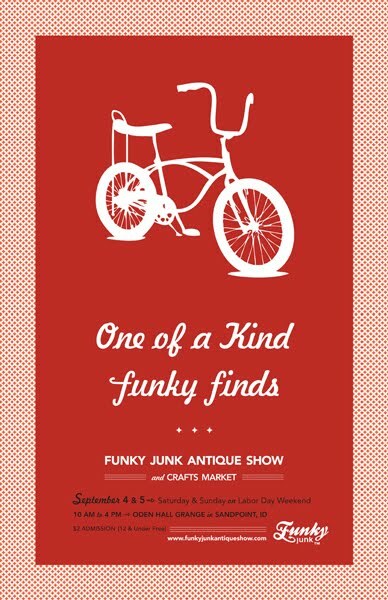 Follow the Funky Junk signs to the junk retreat of the season! And an added bonus - I've had the privilege to make the official Funky Junk Bubble Necklaces for the show! Look for them next to the Funky Junk t-shirts and the first two shoppers in line get a free necklace! I will so be there! Glad to hear that ll the crazy house madness is finally coming to a close!